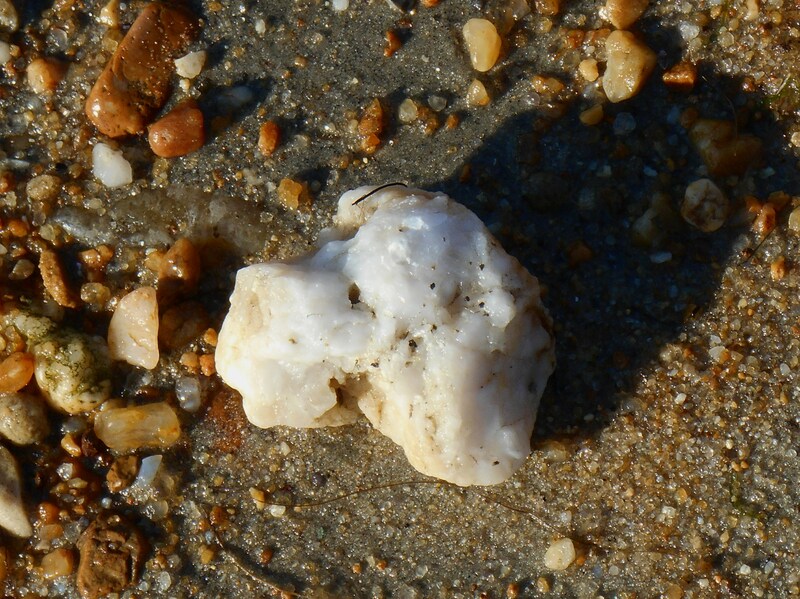 This beautiful white agate washed up in the tide along the James River earlier this week. Many of the happiest moments of my life have been on beaches, wandering along the edges where sea and sand meet in the every changing rhythms of the tide. The convergence of water and land, wet and dry, here and there, now and sometime later feel rich with possibility and promise. Time spent wandering the shore opens us both to finding and to losing. 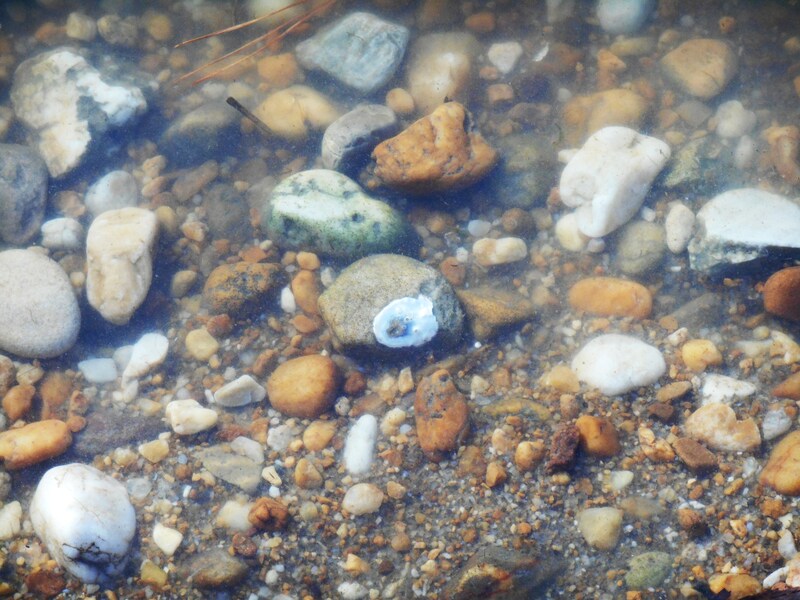 Stones and shells washed in on the waves have always held endless fascination for me. What treasures wait today? 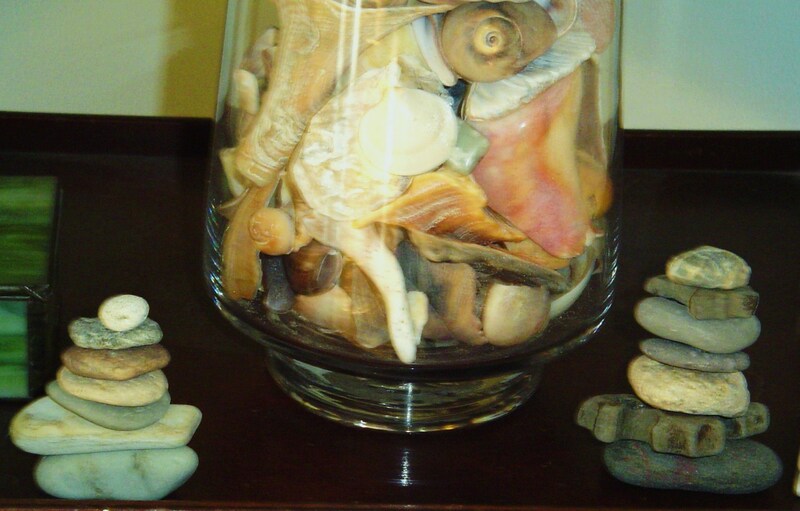 The vase holds treasures picked up along Virginia Beach, and the stones are from the beach in Oregon. I’ve always been fascinated by what washes up in the tide. There is a beach along the Carolina coast where I’ve spent days of my life searching for for fossilized shark’s teeth shells of every color, sand dollars, bits of coral, and drift wood. I pick up smoothed ocean pebbles. some with a hole already bored through them. On Pacific beaches I’ve collected agates, and grey stones shot through with flashes of white. 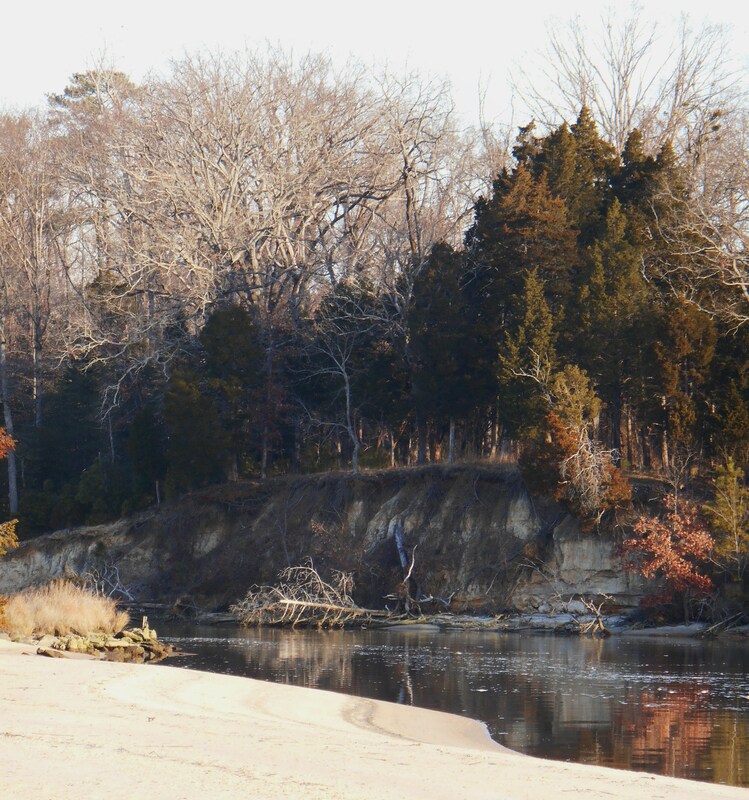 Once I lived along the Rappahannock River, on a sandy beach where shells and driftwood washed up with each tide. Herons, ducks, eagles, and geese were constant companions, many living on an island close to shore. The river’s constant motion was its own gift of peace and contentment. Beaches may feel safe on occasional holiday visits, but we can never lose sight that these edges also hold the promise of great loss. The water can rise without warning in great violent waves, reaching for homes and roads built close by. As it washes away a child’s sand castle, so it also claims those things, and people, we hold dear. As sea water rises, we see this again and again around the planet. The cove where College Creek meets the James, along the Colonial Parkway. A Great Blue Heron has a nest nearby. A tiny lesson in my childhood, but one always in the back of my mind. One that guided our move inland. Storms on the Atlantic have long arms, reaching hundreds of miles to take what they will. We watch our roads and bridges to the Outer Banks threatened again and again by the sea. We’ve been spending time on the river beaches of the James this month, collecting photos and examining what has washed up with the tide. We have been searching out the fantastic frozen sculptures growing along the banks during our “Arctic blast.” The ice melted days ago, but the pictures and memories remain. This week’s Tuesday Snapshots are all photos from the beach, from the edges where land meets sea, dry meets wet, concrete meets possibility, and this moment meets the vast ocean of time. Even in winter, the beaches are places of great peace and beauty; offering up their many gifts to those who come seeking them. Nice agate find. As a child, I used to collect agates on the Oregon beaches, but my mother told me that years ago, all that was covered with a huge layer of sand. I still have a few agate treasures left somewhere buried in a layer of stuff. We could find blue and black agates. Puget Sound area? We have friends who run a gallery on Whidbey Island. We love islands up there. What a great blog. I love your photography. What inspires you to write? I love this post about where you live. Very refreshing! It sounds like a magical place. Great blog.